If you are reading this, you may be one of the millions of people suffering from Freezing Office Syndrome. Winter, summer, fall. Whatever. It doesn’t matter. Your office’s A.C. is set to approximately 3 Kelvins year round. Office temperatures do not conform to any other laws of science or physics. They are their own atmosphere, like Mars or the Biodome from Biodome with Pauly Shore. Those afflicted with Frozen Office Syndrome often adapt by wearing specific attire meant for arctic climates. Many Frozen Office Syndrom sufferers keep a blanket under their desk. Clothing alone cannot protect them from the elements. A common method of temporary relief is to blow hot air into the sleeves of your desk hoodie. Sufferers may huff at their sleeves like The Little Match Girl striking her last matches as she hallucinates to her death. In the summertime, if God forbid you wear a T-shirt to the office, you will be in mortal danger. Arms quickly become two icicles sprouting out from your body. Frostbite and even death by exposure can set in rapidly to anyone who wears a sleeveless top and forgets a cardigan. Do NOT bring your desk cardigan or hoodie home to wash it and forget to bring it back. You WILL die immediately. Though some offices have warm rooms, some Frozen Offices have no relief in sight, just endless corridors and cubicles of bleak tundra. Nothing but subzero wasteland as far as the eye can see. In the summertime, when sufferers get outside to go to lunch, they may find even unbearable summer heats welcome and tolerable. On a 90-degree day, you’re elated as you skip outside, finally thawing out. No animals were harmed in this simulation. After months or even years of Frozen Office Syndrome, sufferers may become almost immune to the cold. The most common and pernicious symptom of F.O.S. is Cold Mouse Hand. It’s when the hand you use for your mouse gets super cold because it’s just sticking out there, exposed all day. The solution to Cold Mouse Hand includes wearing a glove, or frequently taking breaks to sit on your hand. Do not fall prey to snake oil “miracle cures” for Frozen Office Syndrome. These will not help you. 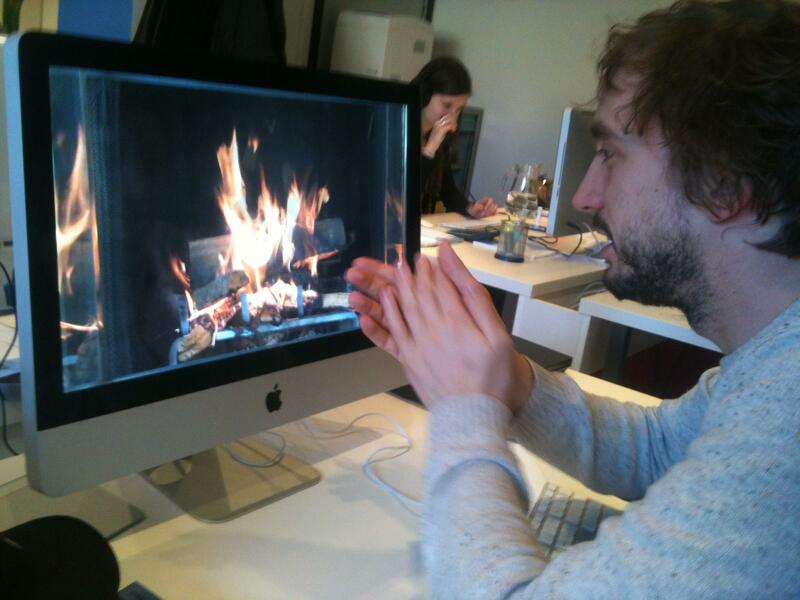 This computer will not provide real warmth. The fire is NOT real. Do not be fooled. Do not attempt to contact your office manager. Resistance is futile. It is a building-wide issue, not just your office. The only thing colder than your office will be the chilly reply of someone who has been fielding this complaint for years. Currently, there is no cure for Frozen Office Syndrome. Bundling up is the only way to treat the symptoms. Scientists will continue to work around the clock for a cure. Stay warm in there, comrades.